Transcutaneous Electrical Nerve Stimulation, more commonly referred to as TENS (or sometimes TeNS), is defined by the American Physical Therapy Association as application of electrical current through the skin for pain control . The unit is usually connected to the skin using two or more electrodes. 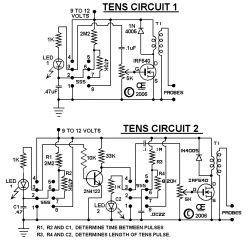 A typical battery-operated TENS unit is able to modulate pulse width, frequency and intensity. Generally TENS is applied at high frequency (>50 Hz) with an intensity below motor contraction (sensory intensity) or low frequency (<10 Hz) with an intensity that produces motor contraction ..